Sometimes it seems as if safety and automation work against one another, but that doesn’t always have to be the case. With the influx of automated machinery, end-of-line packaging plants have more flexibility and higher production, but there is still a risk of worker injury if these systems are not properly equipped with sensor technology designed to protect people from harm. In order to ensure the safety of people and machines, safety light curtains can provide a point of operation, area, and access protection. It can also be used for automation tasks such as measuring and detection. End-of-line packaging plants can take advantage of safety light curtains to protect workers from automated machinery performing tasks like stretch wrapping, palletizing, and robotic pick/place processes. Simplified installation/commissioning: Installation/commissioning is easy thanks to eight multi-colored LEDs for alignment status, protective field status LEDs along the length of the device, and integrated visible alignment aid. IO-Link beam data offers the most extensive support on the market, which minimizes setup or replacement time. In addition, with DIP switch configuration, all functionality is configured without software, which saves you time and money on software licensing costs, training, and the need for a computer on site. Extensive Diagnostic/Troubleshooting Capabilities: IO-Link provides the flexibility you need to maximize production. With the ability to integrate safety and automation into one device, you minimize initial setup and commissioning costs. In addition, you can access data remotely via any device to eliminate the need to be on the floor. 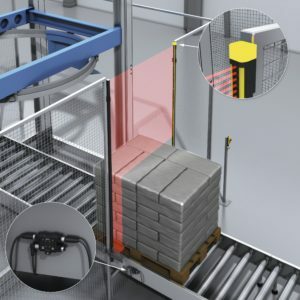 High Production with Little Interruption: The deTec4’s muting functionality allows objects to enter and exit the hazardous zone, but keeps personnel out. This means you can have production running with little to no environmental interruptions, while still maintaining maximum safety. The system can be setup in a two-sensor cross pattern or with exit-only muting. IO-Link also uses beam data to measure the height of goods, eliminating the need for MLG, distance sensor, or other devices used for automation purposes. With SICK’s deTec4 safety light curtains, you can rest assured that your workers – and your production – are protected and operating at peak efficiency.